Elevated dog beds aren’t as common as other types of bed. I don’t think this is an issue with their functionality; I think it just means that people aren’t as familiar with the design as they are with standard type beds. But the best elevated dog beds can be pretty great beds for the right dog. However, some people believe that raised dog beds can be just as effective at easing senior dog’s joints and muscles as orthopedic dog beds. Also, they are incredibly easy to maintain and store when needed. Raised dog beds are definitely a bed that is worth giving a look. Since the design is so unique, we usually get a lot of questions about the practicality and functionality of raised dog beds. We’ve tried to answer some of the questions for you below! 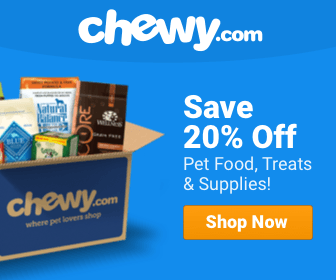 They are good for your dog because they usually eliminate the problem of “bottoming out.” When people buy orthopedic or memory foam beds for their ageing dog, they buy them because they add support and keep the bottom of the cushion from hitting the ground. When the cushion bottoms out, it hinders the support the memory foam provides. Keeping your dog off of the floor also helps them stay warm. The floor can often be cold which will make your dog uncomfortable. Keeping them warm will also help ease their joint pain and help them age better. 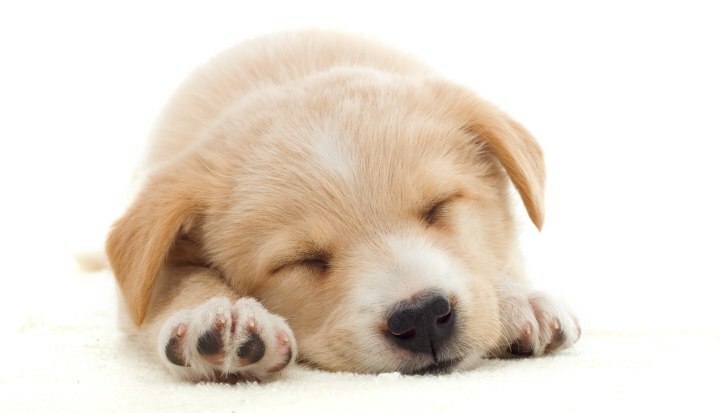 Keeping your dog off of the floor will help keep them away from harmful bacteria. I know what you’re thinking, “they’re dogs! They’re supposed to get dirty.” That’s true; however, keeping them off the floor will keep them away from unwanted insects and parasites. These types of critters are known to weasel their way into your dog’s crevasses while they are in their sleep because they are most vulnerable then. Since the design is a bit different, it does raise a few more questions and things you should be suspicious of when you look for a dog bed. You should ask this question about the canvas and the tubing. Cheap, thin PVC can be chewed through easily and can break the bed and harm your dog. Also, what sort of fabric is the bed made of? It should be a heavy-duty canvas similar to your jeans. Thin, low thread count fabric will likely tear the larger your dog gets. Be careful of this when you are looking for a bed, especially online. This is very important. Depending on what size and breed dog you have, the wrong size dog bed can completely defeat the purpose. If you buy a bed that is too low, and you have a tall, large dog, it may bottom out. If you have a tiny dog, it’s not a good idea to buy a tall bed, because they could strain themselves trying to get in and out of it. This is a good, large bed that is perfect for large dogs, but not extra-large dogs. By large we mean: Dobermans, German Shepherds, Golden Retrievers, Labs, etc. This bed is great because it’s very sturdy. 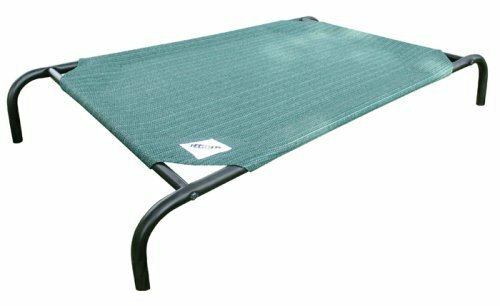 Instead of offering the PVC tubing, this bed comes with a steel frame and strong, knitted fabric. 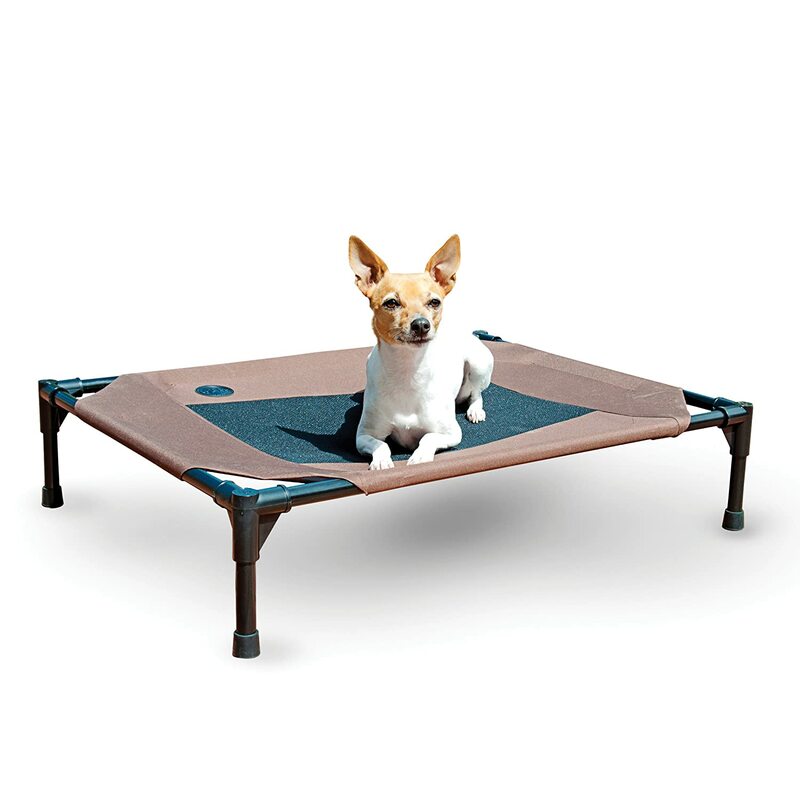 This bed will help your dog keep off the ground, and stay away from harmful insects. Also, it’s incredibly easy to clean, you can usually just wipe it down with a damp cloth and let it air dry before your dog gets back into the bed. 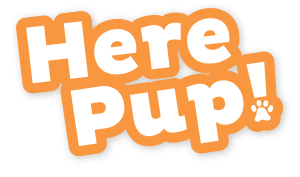 K&H makes great products, and they always seem to find a way into our reviews. This bed comes in large and medium sizes with a waterproof, 600 denier fabric canvas. It’s tried and trusted, and almost everyone who has bought one loved it for their furry friend! Additionally, the bed is a simple design that will allow the bed to be taken anywhere, and it’s thin enough to fit in any car or closet. It also comes with non-skid rubber feet so you don’t have to worry about it slipping out from under your dog when they get into it. This bed is made with PVC. I know I told you to be careful when buying PVC, but this is high-quality stuff. It’s a thick grade of PVC that can support up to 125lbs. So it will be adequate for most dogs, just not extra-large ones. The bed is also made with a strong canvas that won’t tear or puncture easily. Also, it’s easy to clean (as most elevated dog beds are). It can usually be cleaned up with a damp cloth and air drying. This is a great bed that has had excellent reviews. We highly recommend it! This dog bed is made for smaller, lighter dogs. The frame is sturdy enough to handle a dog up to 99 pounds, but more than that and you will be at risk for damaging the frame. 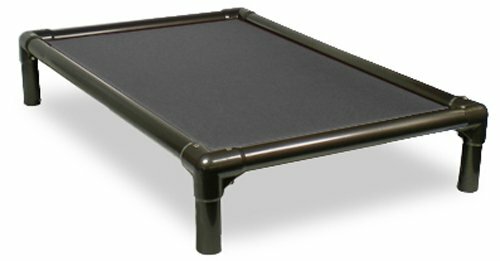 The great thing about this dog bed is that it can be used indoor and outdoor, and it’s strong enough to withstand the outdoor elements. 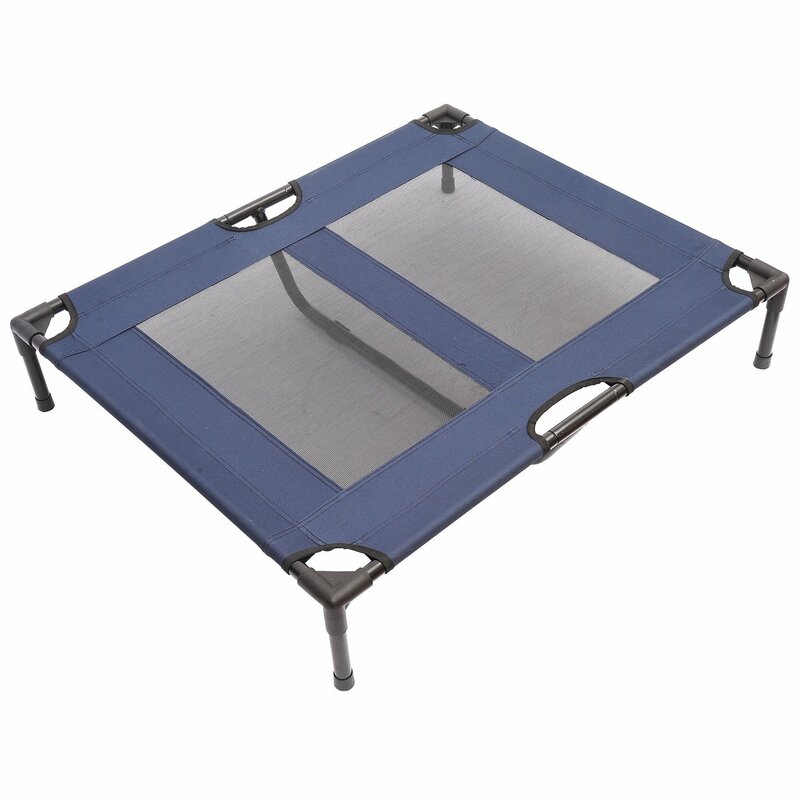 Additionally, it’s made with a mold and mildew resistant mesh fabric that is easy to clean. Also, the Pawhut bed is very versatile. It can easily be stored away in a closet or in the truck if you want to bring it along on a road trip.